← What Are the Risk Factors for Alzheimer’s Disease? 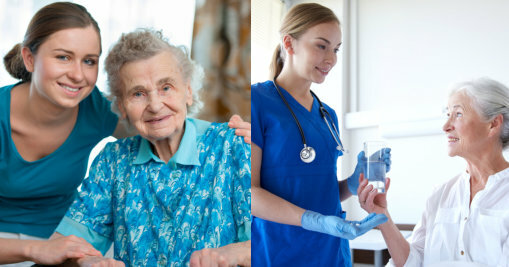 Home Care and Home Health Care are two care options which are provided to homebound patients. Because they are both forms of in-home care, they tend to be used interchangeably. Since in-home care services are among the newest trends in the healthcare industry, it is really important to properly identify Home Care and Home Health Care. As a home care provider, Healing Through Caring Homecare LLC wants you to be well-informed. This is why we have listed down some notable differences between the two types of in-home care. Read on to know more. While these two both have their own set of advantages and disadvantages, it’s undeniable that they are both convenient care options for patients who prefer to stay in the comforts of their home. In choosing between home care and home health care, there’s one important thing to keep in mind—which provider offers the services that best fit the needs of your loved one? After all, they are the focus of the entire process. If you are looking for homecare in Spring, Texas, we might just be what you’re searching for. Know more about us today! This entry was posted in Homecare and tagged Home Health Care, Non-medical Care, Personal Care Services. Bookmark the permalink.